Good for seeing: Nahuna is a marine life magnet where seemingly everything is possible. 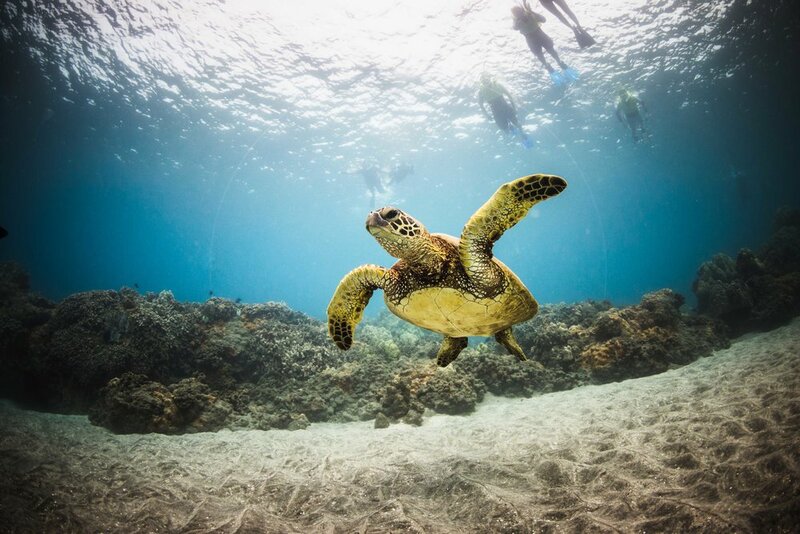 Hawaiian green sea turtles are the most notable draw (as this the site of the original “turtle town”), but you can also see a large variety of reef fish, lobsters, nudibranchs, eagle rays, bottlenose dolphins, manta rays, slate pencil urchins, and eels. There are also healthy gardens of coral, numerous caves and archways, and this is one of our favorite places for a SNUBA dive. Best time of year to snorkel at Nahuna: Nahuna can offer fantastic snorkeling with 100 ft. visibility during any part of the year. 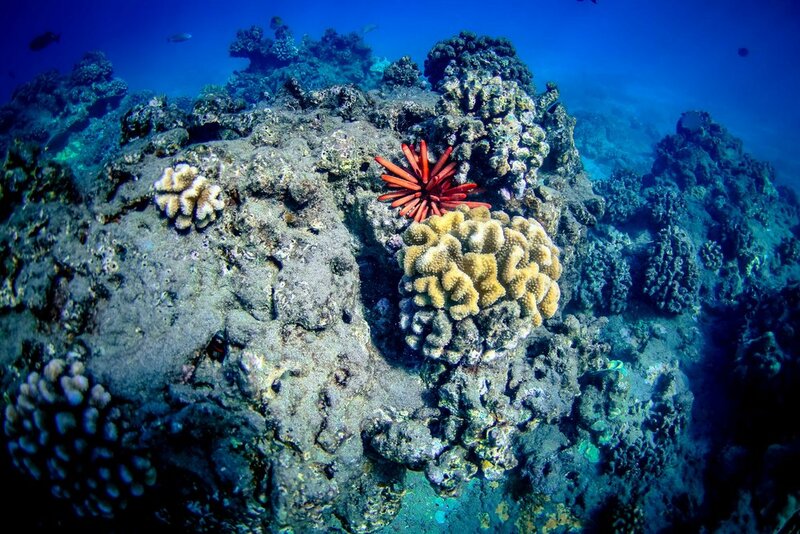 Reasons we might not snorkel here: While the winter months offer the best conditions at Nahuna, summer months can occasionally have large south swells which will reduce the visibility along the shoreline. During these periods of large surf we will instead opt to spend the entire duration of the sail at Molokini Crater, where the deep water on the outside of the crater ensures crystal clear visibility. History: Before the shoreline was lined with luxury homes, Nahuna had a long and storied history which dates back to the ancient Hawaiians. Before the arrival of western explorers, the majority of the ancient population resided here at Makena, thanks to its abundant fish stocks and streams of fresh water. The first landfall on Maui by a westerner was in 1786 by Jean Francois de La Perouse, a French explorer who landed a few miles down the shoreline at an area known as Keoneʽoiʽo. By the late 1800s, the area had become a dock for the Rose Ranch (now Ulupalakua Ranch), and the “Makena Landing” was where ships would deliver supplies to be carried up the mountain. Cattle wouid also be driven down towards the shoreline, andas late as 1946 this area was still used as an active port for loading cattle and supplies. Small bands of foreign settlers began inhabiting the shoreline , including a family of Chinese laborers who are buried along the shoreline. Their small graveyard of five headstones give the area it’s current name of “five graves”, one of the numerous names for this stretch of coast. 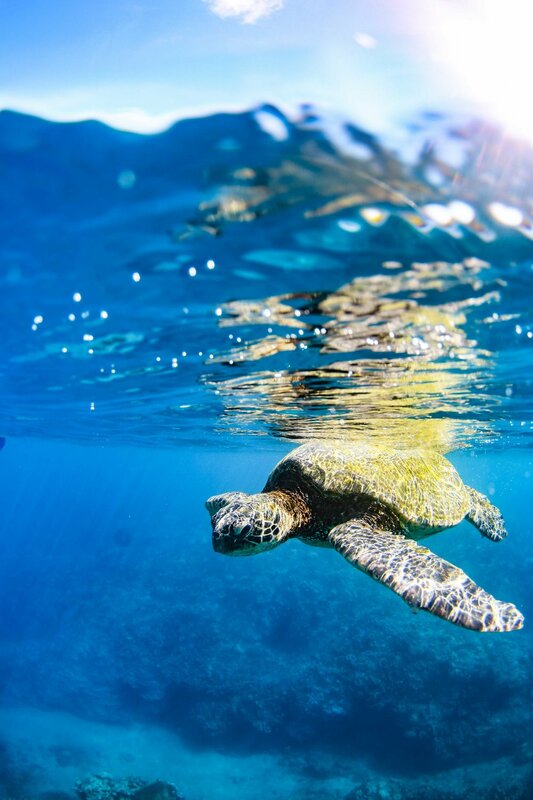 Today, the Makena area contains the largest population of Hawaiian green sea turtles on the southern shoreline of Maui, and it’s a favorite destination of island snorkelers and divers. Trips offered to Nahuna: Our Discover Molokini tour offers trips to Nahuna seven days a week out of Ma’alaea Harbor from 7am- 12:30pm and 8am-1:30pm.